Are you a fan of seasonal novels? I’ve become a sucker for Christmas fiction the last couple of years. And when I spied a novella collection celebrating my favorite season, fall, I could resist as much as I can a comfy sweater and a day of pumpkin carving. 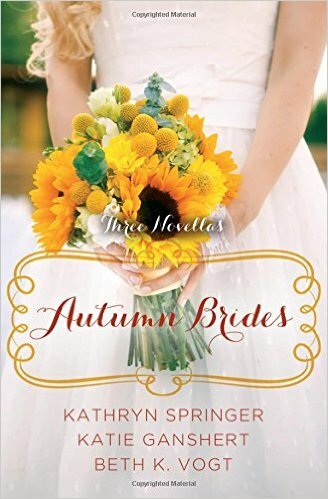 This month, like a big ol’ pile of leaves, we jump into Autumn Brides (Zondervan, 2015), by Kathryn Springer, Katie, Ganshert, and Beth K. Vogt. You get three novellas in one volume. Happily ever after begins today. The honor of your presence is requested at three autumn weddings . . . When Annie moves to Red Leaf, she’s ready to call the little town home, but Deputy Jesse Kent can’t believe his mother has handed the keys to her bookshop over to a woman she met on the internet. Jesse has seen his mother taken advantage of before, and he decides to keep a close eye on this Annie Price. But when a close eye turns into a historical wedding reenactment with Jesse and Annie as the couple, make-believe nuptials quickly give way to real-life emotions. Having celebrated the big 3–0 by ending a relationship, Sadie is tired of romantic relationships-by-text. The only man she knows willing to put down his iPhone and have face-to-face conversations with her is Erik. It’s time to put a 21st-century twist on the Sadie Hawkins’ tradition of a woman going after her man. But when he realizes he’s fallen for her, can Erik convince Sadie his just-for-fun dates were the prelude to “’til death do us part”? A September Bride – Kathryn Springer’s story evoked the charm of small-town America. The fictional burg of Red Leaf beckons the reader like a cozy throw blanket. I wanted to step into the pages and stroll past the quaint businesses and chat with the locals. The writing style is top-notch and tight. An October Bride – Confession: When I realized the premise included terminal illness, I was tempted to skip it. My day job deals with this topic, so it didn’t seem to fit the bill for escapism fiction. But this story won the 2015 Carol Award in the novella category, so I decided to give it a try. I’m glad I did. Ganshert deftly balances a weighty topic with a lighter tone that engages. The characters prove likable and believable. And the setting–a big draw in any fiction I choose–showcases the glory of fall. A November Bride – The characters pop off the page. Sadie and Erik made me grin and were just plain fun to watch. This friendship-to-love tale weaves backstory into the fabric in a way that adds more depth than most novellas. I wasn’t crazy about: Once or twice, potentially major plot points get resolved too easily. I chalk this up to the limitations of the novella format, but it did irk to a mild degree. And the authors made a few of the secondary characters too interesting! I want to see the brother and best friend pair from An October Bride get their own story. The Bottom Line: Want a cozy read for a crisp autumn day? Autumn Brides steps up to the plate. I recommend with no reservations. Questions for you: Do you ever indulge in seasonal novellas, or do you stick with full-length novels? Thanks for the info, I’ll have to read these? I was charmed by your review and tempted to read at least one of the stories, though I normally don’t go for what sounds like chick-lit. Second the motion on autumn, also my favorite season. This morning, returning from the flea market in Cleburne, the autumn sunlight made familiar sights in Arlington look warmer and richer.